This is a guest diary submitted by Basil Alawi. NetFlow is a traffic-summarization format that was first implemented by Cisco Systems, primarily for billing purposes. Network flow data (or Network flow) is a generalization of NetFlow. Network flow collection differs from direct packet capture, such as tcpdump, in that it builds a summary of communications between sources and destinations on a network. This summary covers all traffic matching seven particular keys that are relevant for addressing: the source and destination IP addresses, the source and destination ports, the protocol type, the type of service, and the interface on the router[i]. SiLK is a suite of network traffic collection and analysis tools developed and maintained by the CERT Network Situational Awareness Team (CERT NetSA) at Carnegie Mellon University to facilitate security analysis of large networks. The SiLK tool suite supports the efficient collection, storage, and analysis of network flow data, enabling network security analysts to rapidly query large historical traffic data sets[ii]. NetFlow is available in vSphere distributed switch version 5 or later as well as in Cisco Nexus 1000v. VMware vSphere 5 supports NetFlow v5 while Cisco Nexus 1000v support Netflow v5 as well as Netflow v9. 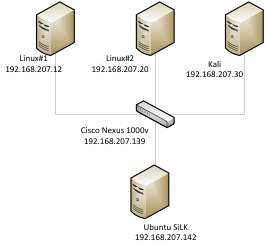 The test lab consist of Vmware ESXi 5.1 as a host ,Ubuntu 13.04 as netflow collector and analysis workstation , Kali Linux with an IP of 192.168.207.30 , Linux#1 server with an IP 192.168.207.12 , Linux#2 with an IP of 192.168.207 and Cisco Nexus 1000v switch with an IP of 192.168.207.139. For this diary the SiLK will be running on a fresh Ubuntu 13.04 installation. Here is a step by step instruction on how to install SiLK on Ubuntu Linux. 9- copy the startup script into /etc/init.d and set it to start on boot. sudo sudo update-rc.d rwflowpack start 20 3 4 5 . 1-Create and configure the /data/silk.conf file. You can use the below text, replace the word Nexus with your netflow enabled device. # line is sufficient for sensor definition. # The plug-in to load to get the packing logic to use in rwflowpack. # The --packing-logic switch to rwflowpack will override this value. rwcut Print selected fields of binary SiLK Flow records and prints the records to the screen in a textual, bar (|) delimited format .rwcut can take input piped from rwfilter command. rwstats - Print top-N or bottom-N lists or summarize data by protocol , rwstats has two modes of operation: it can compute a Top-N or Bottom-N list, or it can summarize data for a list of protocols. In this example rwfilter will read data from Nexus sensor, --protocol switch is the IP protocol number ,the most common used protocols are icmp=1,tcp=6 and udp=17 ,0-255 means select all possible IP protocols ,. The --protocol switch is a partitioning switch, --pass=stdout will Send SiLK flow records matching partitioning parameters to pipe . By default the output of rwfilter is in binary format not in ascii format. The rwstats will compute the Top-N list, the –fields sIP,dIP will display source IP address and destination IP address ,--count=10 will choose the top 10 and –bytes will choose the top 10 based on the bytes value. --fields sIP will display the source IP address. In this example rwfilter will write all the records that doesn’t have both source and destination IP address within the 192.168.20.0 range. In this example rwfilter will pass all of the records that have 10000 bytes or more. The hyphen symbol (-) is more or equal.